If you’ve ever worked with us, you’ve probably seen a hand-sketched version of our bowtie concept—it’s the foundation for virtually all of the work we do. Our simplify-clarify-amplify bowtie is what separates purposeful communications from intuitive desktop publishing. If all you ever look at is your company’s big picture, it’s quite easy to miss the details. And if you’re too bogged down in the details of day-to-day work, it’s easy to forget the big picture! Brand clarification is all about helping you “see” your company’s complete brand picture—details and all. To get there, we pass your brand through the funnel of attributes and features, convert it into benefits that illuminate values and positioning, then put it into meaningful words. In fact, we challenge ourselves to say the most important thing — the brand’s signature — in 7 words or less. This process enables us to simplify the message until we are able to clarify the brand’s most compelling, enduring and differentiating truths. We then amplify that which sets it apart to the target audience using robust copy, distinctive design and innovative tactics. Of course intuitive design can set you apart from the crowd too, and even at times do it very well. The problem, however, is that each communication task becomes a one-off tactic. This can lead to inconsistent messaging and a fuzzy brand identity. Worse, the one-off nature provides little opportunity for long-term brand equity growth from your communications investments. 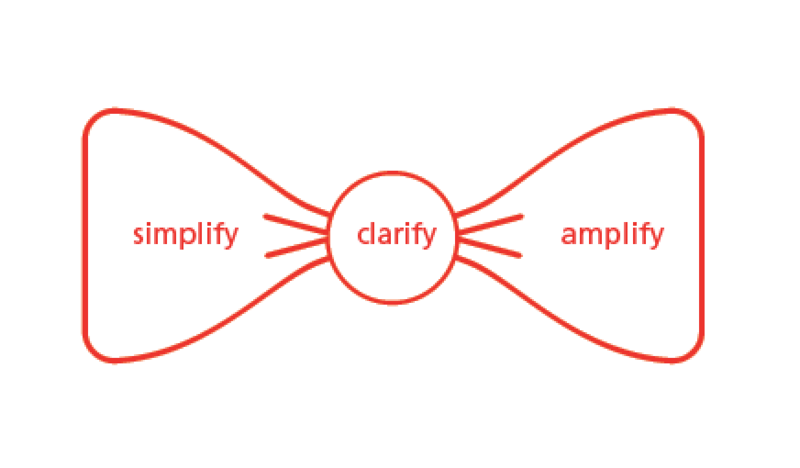 On the other hand, by using our simplify-clarify-amplify model, you take a purposeful, brand communication approach that sets your organization up to start turning heads for all the right reasons.